Well here it was, doctor the final stage race of the year. I was really excited for this one for two reasons. One, cheap its the first stage race this year that I was going into knowing I had good legs, this web two, it was in Eugene, so I had all the relaxations and resources one could want, since it was here at home. The first day, Maxon Road Race, is the “Thursday Nighter” course, so me and all the other Eugenites were pretty familiar with the drill for this one. The course itself isn’t particularly challenging, or going to make or break the final results, but nonetheless, it was a chance to make some time. I went off with a couple of moves that looked like they could stick, but by this point of the season, everyone knows what everyone else’s legs are up to, and something that went off with intent and had some good riders in it, was brought back fairly quickly. It didn’t help that Mid town was there in force either, the fact that there were about 4 red mid town kits at the front at any one point definitely made you think twice about who was going to get up the road. Eventually, Quinn rolled off the front, very smoothly and with no attack, just rode off and no one went with him. A little later, Rob and Paul went off to join him. I made the motion to do the same, but got about half way, looked back and saw the pack chasing and figured it wasn’t going anywhere with only about 5 miles left in the race. I sat up, the pack went hard over sprinters hill, but then people started to go into field sprint mode, and the pace let up. I attacked in a last ditch effort to gain some time, managed to stay way to take fourth, but the field sprint was right on my wheel, so even though I went off at 2k to go, I took the same time as the field. Darn! 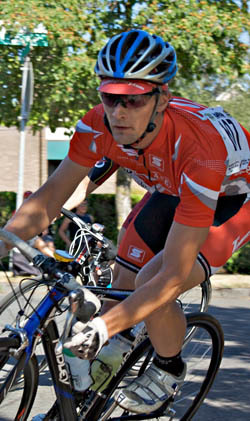 The next day was the TT and the crit. It was cool and overcast for the TT, you can definatly tell fall is almost here. I warmed up for the TT and got ready to go and try to not lose time, but since I was starting behind Galen, and in front of English, I was in the middle of TT specialist sandwich. I threw down a descent time, nothing to brag about, but it was enough that I wasnt that far out of the running for a top GC position. I got passed by English, and tried to use him as a carrot, but I guess I just wasnt man enough to push a 55×12 on the flats with out blowing up. Man that guy can go! Maybe next year. The afternoon consisted of a nap, it was wonderfull. It made me think of just how great a house cat has it. Gets to hang out, play do whatever it wants, and then come home and nap in the warm laundry. The life. But not mine, I woke up to rain, and knew that unlike a cat, I didnt have a choice wether or not to play in the weather, and would have to ride in the rain if thats what it was doing. Went to the crit pretty early so I could watch kareys race before warming up and racing mine. It was a pretty exciting race, and Karey won the field sprint, her first P/1/2/3 win. Looks like all that sprint practice shes been doing has been paying off! Luckily for me, the rain had moved on and it was cool, sunny and dry when my race started. I tried to stay in the pack and save a few matches for Mondays race. The field stayed together despite some attacks and attempts for breakaways, and it came down to a sprint finish. Took 2nd in the field sprint, and got a time bonus, which was nice and it moved me up a few spots in the GC. Time to go home and get ready for the main event. It took me a while to get to sleep, probably from taking such a long nap in the afternoon, but woke up feeling pretty fresh for the Wolf Creek stage. I knew today’s race would be decisive in the GC order, so I wanted to make sure to show up with my A game. The race got off to a pretty slow start. Everyone knew that the race was going to come down the climbs, so despite a few attacks, it was pretty chill rolling into the climbs. After the main climb, Quinn went up the road on a false flat uphill, and I joined him shortly after have to make a couple of attacks to shake the field off my wheel. We worked together on the false flat climb over its top and down the descent until we had caught some of the other riders that were off the front. One would normally think this would sound like a good deal, but considering Quinn was sitting 2nd in GC, and the GC leaders team mate was one of the guys OTF that we caught, you can bet that he wasn’t going to put much effort into this break away. Me, Quinn and another rider ended up doing all the work. Got a gap with two riders and left Quinn and mid town to battle it out for themselves and rode along, but it wasn’t long before Collard attacked Quinn on a climb and joined us at the tete de course. We rode tempo over the climbs, but there was a chase group of 5 that was coming up on us on the False flat where Quinn and I had gotten away the previous lap. Collard said he wasn’t working since his team mates were in the group behind us, so I sat up, coasted down the descent and waited for the group to catch us. Now, in this group of 8, there were 3 midtowns so I was cautious not to put too much into it, especially after being OTF for a lap. On a short climb before the finish, Miller attacked and English went with him, I shot after this group as well knowing it was likely not coming back. We got the gap over the climb, but English was refusing to work, so it was all up to Carson and I to open up the gap. We made the corner onto the final 1k to the finish, I felt pretty toasted from the days effort. I didn’t quite have it to take the win, and came in 10 seconds back behind Carson for 2nd and moved up to 3rd in the GC. Nice job in Eugene. What are your plans for 08? Another year of chasing the dream? Next year will be another year of chasing the dream. No official plans yet, Ill be finishing up school in the fall/winter so will have a lot of time to train and want to be somewhere warm during winter base miles for once as well.